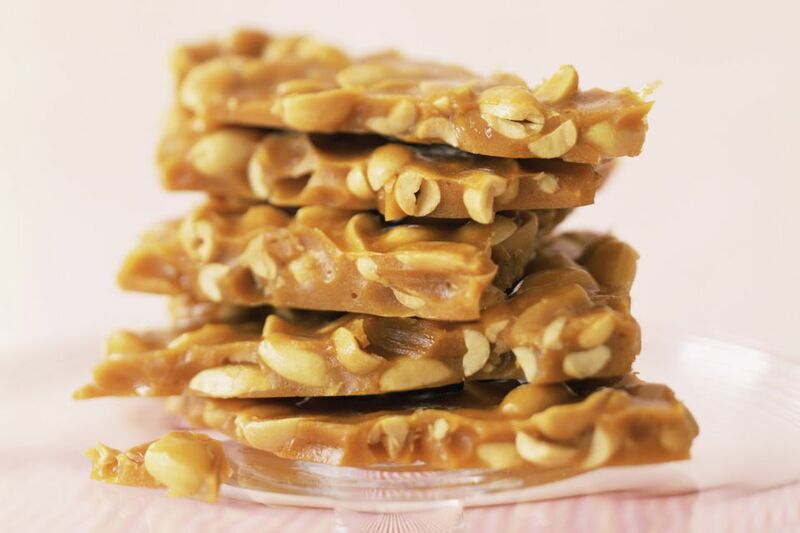 This toffee recipe, featuring honey, peanut butter, and whole peanuts, is a delicious twist on an old favorite. The honey adds a slight chewiness and a subtle note of sweetness to the double peanut flavor. A good candy thermometer is essential to this recipe. Be sure to stir constantly and monitor the temperature the whole time, since candy can quickly become burned at high temperatures. Prepare a large baking sheet by lining it with aluminum foil that extends over the edges, and spray the foil with nonstick cooking spray. Combine the sugar and water in a medium saucepan. Stir until the sugar is entirely moistened, then add the honey, corn syrup and salt. Cook the candy over medium-high heat until it reaches 225 degrees on a candy thermometer. At this point, add the peanuts and stir to combine. Continue to cook, stirring constantly, until the mixture reaches 290 degrees. Remove the pan from the heat and stir in the butter, baking soda, and peanut butter. Mix until well-combined, and then pour onto the prepared pan. Spread the candy as thin as possible with a spatula or spoon and allow it to set at room temperature. Once it is entirely cool, break it into small pieces to serve. Store the brittle in an airtight container or plastic bag at room temperature. Click Here to View All Honey Candy Recipes!